I used to go through life without thinking much about things. I wasn’t much of a planner at all; in fact, I was both irked by, and in awe of, people who were. How could they so confidently know what they were going to want in a few days, a week or even months? I had the hardest time picking a major in college because I couldn’t imagine that I knew at 19 years old what I was going to do for the rest of my life. My reality today? Having food allergies means I have now become the biggest planner. I can’t count on the ease of quick grab-n-go type foods since they typically contain ingredients I can’t eat, so I end up bringing snacks with me everywhere. I’ve become one of those people who eats dinner for breakfast (avoiding grains, dairy and eggs make breakfast foods near impossible), and I find myself reheating leftovers while my husband and son indulge in my old favorites, including breakfast tacos. Sadly, I live in Austin and can’t eat breakfast tacos! Speaking of my son, I’m raising a gluten, & dairy free kid which means I have to be prepared much more so than if I could simply rely on a quick drive thru or convenience store for a cure of the hunger pangs. So, when a friend sent along a link to a book written by a set of Paleo parents trying to help others learn how to live a Paleo life with their children, I quickly bought a copy. To be honest, raising a child is complicated enough, but when you throw in food allergies or sensitivities it takes it to a different level. I want to make sure he doesn’t feel left out, or like the oddball of his friends. So while I now carry the ‘mom bag’ packed with healthy snacks, and Yelp restaurants for allergy-free reviews often, it was nice to read from another set of parents who are living the allergy-free life and making it work! 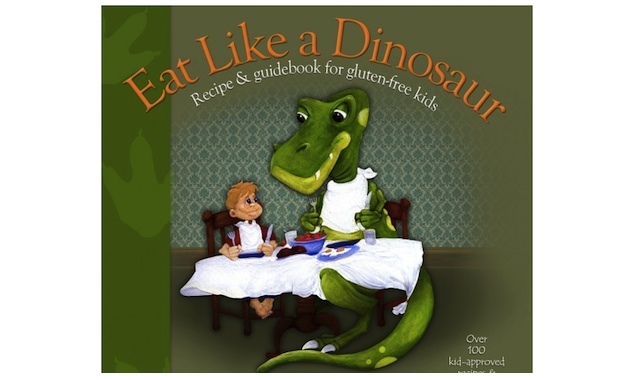 I agree with the parents behind the book, Eat Like a Dinosaur. They’ve found a way to make special diets fun for their kids, and they help parents understand how to keep our children safe and healthy. By following a modified Paleo diet, they have helped heal their children from various auto-immune conditions, which is so important in preventing a series of much scarier health concerns down the line. It focus not just on a Paleo diet, but rather on food allergies in general, and includes old favorites such as cereal, chicken nuggets and waffles, which are all grain-free. Their intent is not on excluding foods, but rather, on eating healthy and delicious ones which mimic the same foods we are accustomed to, but in a healthier version. All recipes are free of dairy, wheat, peanuts and soy. All recipes are labeled so you know if they contain shellfish, tree nuts, fish or eggs. Many of the recipes are set up to show your kiddos what parts they can help with, so they can help in the process of making these foods that are designed to help them live healthy lives. Plus they get to play a part in making some delish dishes! It’s so important to help kids feel normal when they’re dealing with something that society has a bit of a stigma about, and I love that these foodie parents went all out to write a cookbook that helps their kids feel completely normal about their special diets. Here’s a description of the book below and a video clip you can watch as well. I hope this helps you navigate the complexities of a ‘different’ lifestyle choice for you and your family too! Click here to head over to our Amazon store and buy your copy here! Don’t be fooled by the ever-increasing volume of processed gluten-free goodies on your grocery store shelf! In a world of mass manufactured food products, getting back to basics and cooking real food with and for your children is the most important thing you can do for your family’s health and well-being. It can be overwhelming when thinking about where to begin, but with tasty kid-approved recipes, lunch boxes and projects that will steer your child toward meats, vegetables, fruits, nuts and healthy fats, Eat Like a Dinosaur will help you make this positive shift.With an illustrated children’s story describing the paleo diet, and colorful, mouthwatering photographs of recipes without grains, dairy, soy and refined sugar, this book is written for children. For those with food allergies, the top 8 allergens have been visually marked on each recipe for children to self-identify recipes that may contain eggs, nuts, fish, or shellfish.Parents needn’t panic! Details on the tools and products your family needs to get started have been provided, as well as an assortment of tips to help you along the way. Eat Like a Dinosaur will inspire your entire family to shop for new ingredients and get into the kitchen together. Let Matt and Stacy, the Paleo Parents, show you how to make the transformation in your family’s life. With positivity, practicality and an appreciation for the fact that even the healthiest children sometimes want cupcakes and chicken nuggets—this book simply provides healthier ways to give kids the foods they love.